ZynVaded starts out something like this...Once upon a time there was this little bug-like alien race, and they decided to send a probe to Earth to gather data. It just so happens that the probe unknowingly lands on a table where miniature wargames are taking place. The probe next proceeds to send back data to the home-world that Earth should be a push over, because we're all made of metal and plastic, and we're all only a little over an inch tall just like they are too. Once they arrive on Earth, the truth hits them, and they realize how big humans actually are. Now some of the invaders are still determined take over the Earth, while others have come to their senses and want no part of being an invading force, and all they want to do now is live in peace undiscovered here on Earth. Some of the aliens who are against the invading Zyn have formed a rebellion faction called the Sav'm. As they wait for reinforcements to arrive, the bad Zyn, now called the Kyll'all faction decide to setup shop in the basement of a Chinese take-out restaurant. And today war wages on among the now two factions of Zyn. That's pretty much the whole back story in an nutshell. It's clear that ZynVaded borrows a lot from the now classic Micronauts comic books from Marvel, which tells a similar story of aliens crash landing on Earth from the Microverse, and then battling it out among each other as six inch tall combatants right under the noses of humans. It was an amazing story line, with fantastic comic-book art from Michael Golden. It's a must ready if you can find those issues. 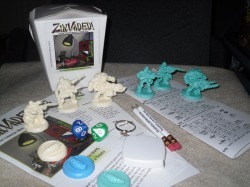 While you could use wargaming/miniature terrain or a gaming board made for wargames to play ZynVaded, the whole idea of ZynVaded is that the action takes place in our real world, on desktops, living room floors, in a closet, even on kitchen counter tops among the appliances, etc. The beauty is that you can use a can of Pepsi as terrain, a sugar bowl, a salt shaker, books, what ever you have lying on your kitchen table at the moment is a gametable setup and ready to go for ZynVaded to be played out. They get some points for presentation too, because the rules come on photo copied fliers that are folded like a Chinese take-out menu, and everything is stuffed inside a little Chinese take-out box. The starter comes with the main rules, More RuleZ and the MissionZ Pack (all three are folded like a pamphlet/take out menu), two character sheets, 2 D10 dice, 2 short pencils already sharpened, a cute little key-chain measuring tape with inches and cm on it both, 3 green models, 3 white models, and 3 little grubs on a base. The rules are extremely easy to learn. SPD is the movement value in inches. MCA is Melee Combat value. RCA is Ranged Combat value. AGL is Agility or how well you can evade attack. ACT is how many Actions you have. CST is how many Actions it cost to use an item/weapon. ROA is Rate of Attack, meaning how many D10 you get to roll to perform that attack. RNG is range of the weapon, and PRC is Piercing, which is the value to beat to cause a wound. Each character sheet has three characters listed on it, and each listing also has a number of boxes marked ammo for the ranged weapons. You mark these off as you go, so you run the risk of running out of ammo, which I thought was a nice touch. Three little circles also exist with EVO printed over top. This is for Evolution, and how this works is every time you kill someone you mark a box, and if you're alive at the end of the game you mark a box. When all three boxes are filled, you can then roll a D10 and compare it to the EVO Chart. On this chart you can end up having to roll on the Found Items Chart, or you can end up with a 1+ SPD, ACT, MCA, RCA or AGL bonus. Once you've filled the boxes, you also erase them and can begin another round of Evolution for your character. This is sort of like a campaign bonus, but since it counts kills too, you could theoretically evolve before a game ever ends in a larger game. The Found Items Chart includes Extra Clip, Med Kit, Grenade, Speed Boost, Adrenaline Shot and Trap single use item/bonuses, and each of these except Adrenaline Shot cost one Action to use. Adrenaline Shot is a last ditch effort bonus, allowing you to make one last attack before being removed from play. Speed Boost grants a one time use of an extra 3-inches worth of movement. Trap I really don't quite get, because I don't see how that name fits the ability, but it simply allows you to swap places with any other team model within 12-inches. Each model also has SpAb (Special Ability) listed on their character profile too. The Exoskeleton that the Support model has grants a +1 to the attacking models PRC, making it harder to pierce his armor. The Scout has Fortify granting a +1 AGL while in cover (in addition to the normal cover modifier), and the sniper rifle the scout carries causes 2 damage. So each of the characters are quite unique, and their profiles reflect their roles quite well. Each model also has a once per game single use ability called Talentz. 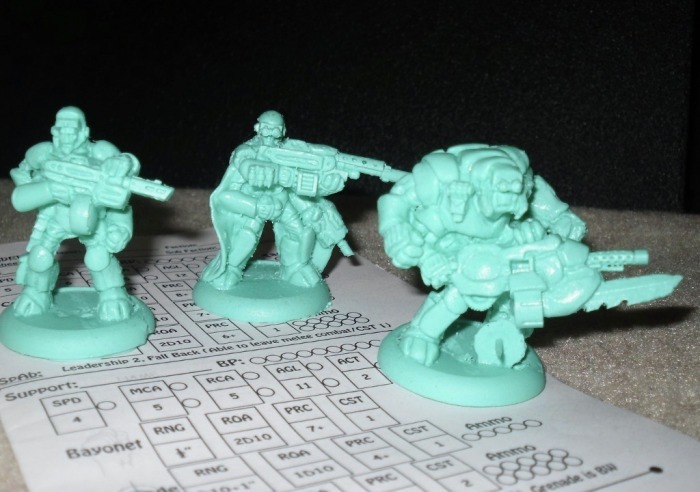 Task Master allows the leader model to grant one team member 1 extra ACT point for that round. Sugar Rush grants an extra 3-inches of movement for one round, and Holo Field nullifies the damage of a single ranged attack on the model, and then allows the model to move 3-inches, or it allows a model to move away 3-inches from melee for free. You simply mark the talentZ box off once you've used it. This reminds me of the Feats in Warmachine. Every model is given X number of ACT points per round. The Leader has 2, Support has 2 and the Scout has 3. Shooting will cost a number of ACT points equal to the CST value of the weapon. For instance the M.Gun used by the Leader has a CST of 1 ACT to fire it, but it has a ROA of 2D10, so you're essentially getting 2 shots with the machine gun for one Action. However the Support model's Heavy M. Gun has a CST value of 2, and he only has 2 ACT points per round to work with, so he won't be firing and moving. Although he could throw his grenade for 1 ACT at D10+1 RNG, or use the Bayonet at ½-inch range with a 2D10 ROA. Movement is the SPD value in inches, and you could if you wanted to move three times with all 3 of the ACT points that the Scout has for an 18-inch move (6-inches x3 essentially). Models with 2 ACT points can move twice and do nothing else if they wanted as well. If you have enough ACT points to allow for it, you can also move and shoot, or shoot and move, it doesn't matter which order, the only limitation is you cannot perform a Ranged Attack before or after making a Charge, unless a model has an ability that allows it. A Charge also cost 2 ACT, and adds +2-inches to your SPD for the Charge. You also gain a bonus of +1 to hit, and +1 PRC rolls for that single melee Charge attack. There's also no pre-measuring allowed in the game. All attacks are declared first, then ranged is checked. So you run the risk of missing with a ranged attack, or charge altogether, and you still waste the ammo and the ACT to perform the attack when you miss too. Line of Sight is straightforward. If you can draw a line to any part of the model, it can be a target. Facing also isn't an issue, as they claim due to the insect-like antennae they can see a full 360-degrees. To perform a ranged attack to hit roll, you simply roll D10 equal to the ROA value, add your RCA value to the result of each, and compare each combined result to the AGL of the target model. To handle damage, you now roll a single D10 for each successful hit scored, and you compare the result to the PRC value of the weapon. Match or beat the PRC and you've caused a wound, and you now mark off one of the BP circles at the top, which stands for Body Points on the target model profile. Melee is a similar process. You first pay the CST of the weapon to use it from your ACT pool for that round. You next roll D10 equal to the ROA of the melee weapon, in this case we'll use the Bayonet as it has a ROA of 2, and then add your MCA value to each roll, and compare each combined result to the AGL of the target model. Meet or exceed the AGL and it's a hit. Damage is handled the same was a range, by simply rolling a D10 and matching or beating the PRC value of the weapon to grant a wound. There's a few other smaller rules too, like Swarm. If 2 or more models from the same team are in melee with an enemy model, they gain +1 to their MCA and PRC for every friendly model in combat. You also can't break away from melee, it has to be resolved to the death, or you need a special ability to get away. Rolling a 10 is always an Auto Hit, and you automatically pass the PRC roll as well, but rolling a 1 is an Auto Miss and Jamz a gun, making you loose any remaining ROA rolls as well. Thankfully Jamz only penalizes you for that round, because the beginning of the next round the weapon is unjammed and ready to use again. Similarly rolling a 10 in Melee is also an Auto-Hit, and they auto pas s the PRC roll too, but rolling a 1 in melee is simply an Auto-Miss regardless of the targets AGL. There's about five missions included as well in the third MissonZ pamphlet, some of which have some nifty rules. One takes into account that the lights are off so RNG and movement is limited since it's dark. Another mission has a special rule that if you don't end your turn within ½ inch of an object, you are to roll a D10. If the result of this roll is a 10 then a human has spotted you and squishes you, removing that model from play. Cool stuff for sure, and they're all great fun. This is where the three grubs models come into play too, as they're used as objective markers in some of the MissionZ too..
At a glance I really like these models in terms of their sculpts. 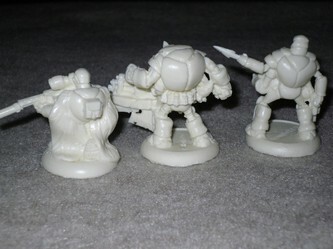 All of the models are cast in colored resin. 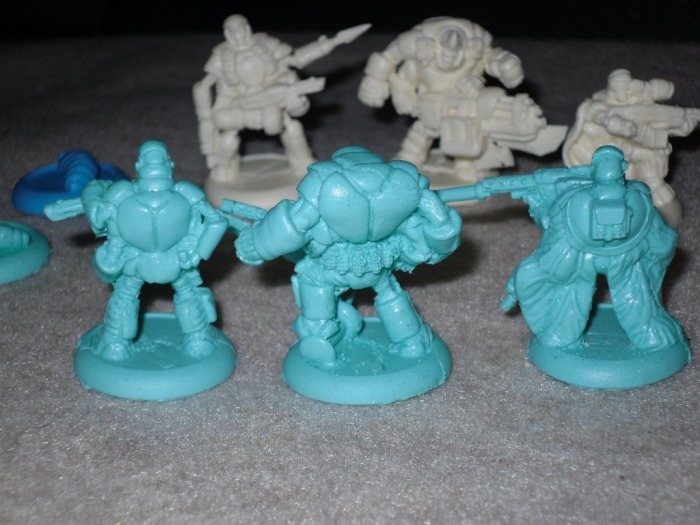 They have that toy soldiers look about them, since they decided to offer two different colors of models to represent the factions. The two main factions are Kyll'al and Sav'm. Pretty slick names if you ask me, and it's clear who the aggressors are by those names. They also offer names for sub-factions. These are only needed if you wanted to take part in games with up to 3 players per side. 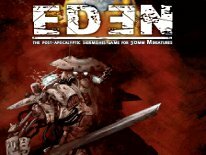 Ma'Im, Su'nDaar, and Gre'de are the Kyll'al sub-faction choices. V'aan, Yoon'yon and Ze'lots are the Sav'm sub-faction options. Although these faction/sub-factions are fluff more than anything, because choosing any of them doesn't change the models strengths or weaknesses. Also the character profile sheets are identical for each side. Each Leader, Support and Scout model for each side have identical stats. Therefore game balance isn't an issue. You have the same chances as the other guy, since the stats are the same across the board for each side. The models themselves are very cool. 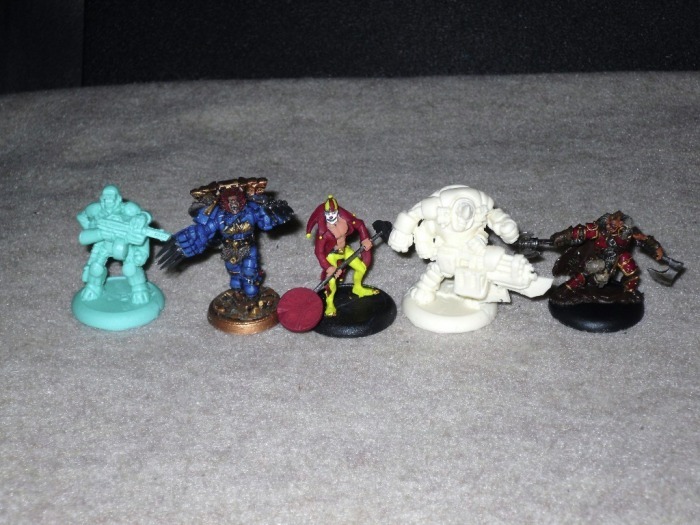 They're rather large, and I'd say they're bigger than most 28mm models. They all have thick bodies, all of them have 4 arms, and quite a few bug-like visual attributes. One thing I really look for in models is character, and these all have lots of character. 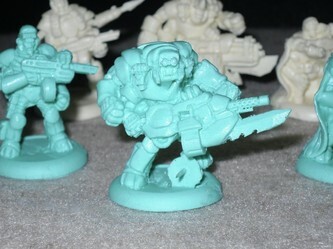 They're fun and comic-book like in appearance, instead of being dark and grim like say Warhammer 40k models. 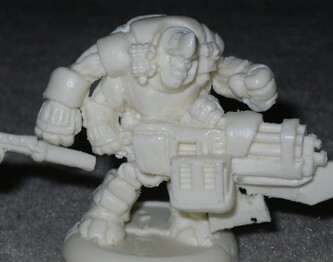 I can't complain at all about any of the sculpts, because they're all unique, and all very cool. At present there's 4 models for the Kyll'all in off-white resin, and 4 models to represent the Sav'm in light green resin. There's a Leader, Support and Scout in the starter set for each side, and there's an Assassin add-on model you can purchase separately for each side as well, which takes up the Scout slot. So no matter what you're always using 3 models per side. 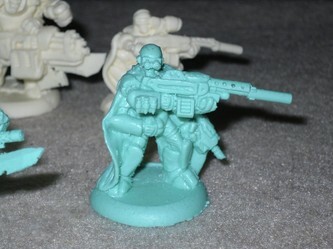 The Kyll'all Leader model sports some sort of large bladed weapon, is holding a pistol, and the two front most arms are holding a machine gun-like rifle. The Kyll'all Support guy I think it my favorite heavy weapons guy from the two factions, as I really like the rhino-horn-like helmet and his huge heavy machine-gun. The blades underneath the weapon are really impressive too, as not only is there a bayonet-like one, but another blade pointing straight down looks like an axe-blade or something. His outfit also features little grenades. Those are all weapons reflected in his profile, so visually he matches what his profile says he has in terms of weaponry. That's a really nice touch. Lastly the Kyll'all Sniper is sporting a rather large scoped sniper rifle, along with what looks like a cape, but a closer inspection reveals the cape to be a set of wings. He's also posed down on one knee, and the wings are strictly for looks, as there's no use for them in the game. The Sav'm Leader looks a little thinner than the Kyll'all Leader, and the facial detail I think is nicer, as he has more of a drill sergeant look about him. He appears to be barking orders, plus he's also holding his rifle more true to military style. 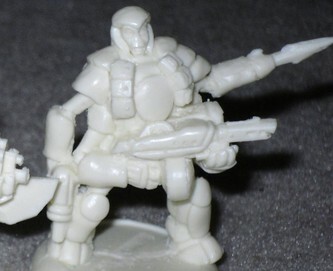 The Sav'm Support model is standing on a thumbtack, and his heavy weapon looks more alien than the Kyll'all Support option. It's held like a chainsaw, encased in an alien-bug-like shell, with a heavy machine gun built in over top of the huge blade. The head is quite interesting too, as it looks like there's some sort of NVG (Night Vision Goggles) apparatus over the eyes, with pincer-like things pointing out and downwards from each side of the jaw. The Sav'm Sniper is a standing model, holding a rather impressive looking sniper rifle, wearing NVGs, while holding his pistol in his other left arm. He too sports the wings, which from the front look like a cape. Lastly if you wanted to drop the Scout/Snipers and add Assassin models instead, the Kyll'all Assassin is hooded, holding two double-bladed sword-like weapons, a pistol in his other right hand, and a stun grenade in the second left hand. The Sav'm Assassin appears to be a female bug, and she's holding a single sword with both or her right arm hands, a pistol in a left arm, and another sword is held behind her back with her other left arm. The only problem I have with the models is that the Starter set models are all really rough around the edges. There's lots of flash and some quite thick mold lines to tend to. 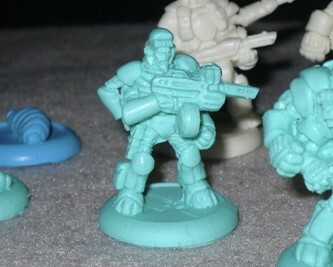 There's also some miscast-looking spots in places around the edge of the bases. 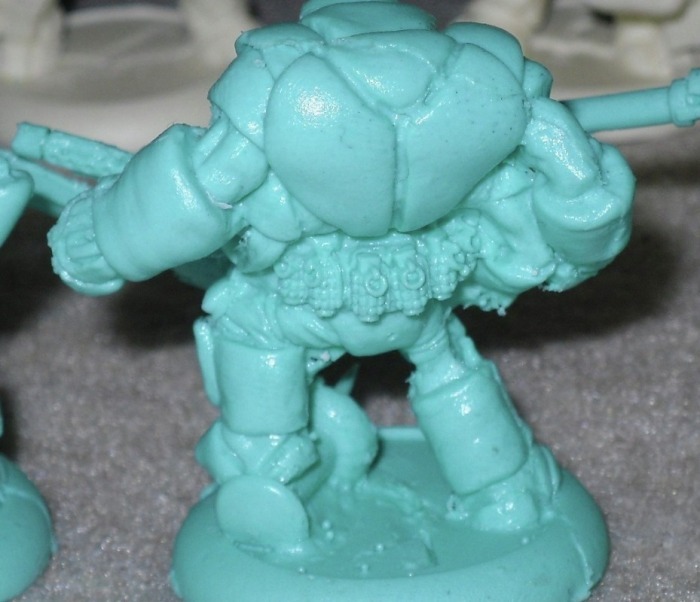 The tiny little micro-beads of resin all over some of the models also require extensive cleaning up. Therefore there's quite a bit of work to do before ever considering laying primer and paint down on these models. 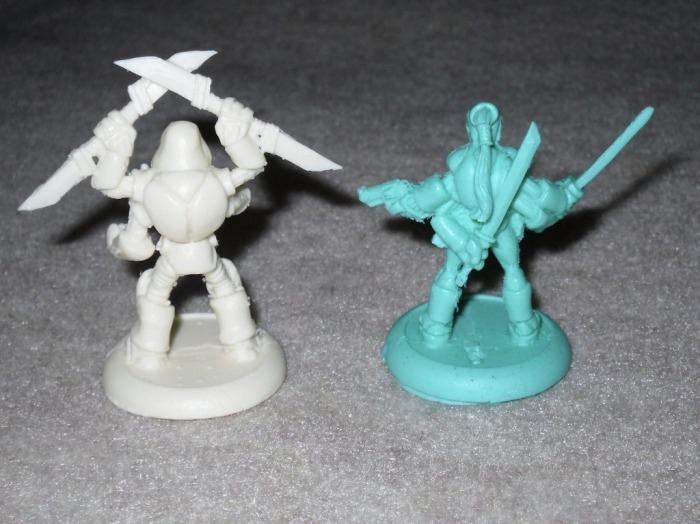 I'd have to say these starter set models are the roughest models I've seen in a while. A few bubbles are also present in the resin, so the tiny holes will need filled in too before paint is an option. Even the 30mm round lipped display bases molded onto the models are thick underneath with excess resin that needs filed or cut off before the bases can sit like they should. Now the Assassin models are a different story. They're a little rough, but much much cleaner all around. I didn't find the little micro-beads on the Assassins, and they appear to be a much better run altogether than the Starter kit models. My guess is that they may have learned from the mistakes made on the first run of the Starter kit models, because the difference is day and night between those and the Assassins. Although I will say this, it's clear that these models are a first attempt from a completely new and unknown small company, and for a first attempt I must say they've done really well. The sculpting is top notch. All they have to do now is utilize some better form of quality control, or rethink what they're doing in the casting process that is leaving the models so rough. It's clear that the Assassins are an improvement too over the Starter kit models, so they may already be moving in the right direction. All in all, this really isn't a bad game. The rules are simple enough that all you need to really know can be found in the two pamphlets. These mechanics are so simple, that diagrams and photos of the models in action would be overkill too. I think with a little refinement, it could be so much more. Based on what I've gathered, they're still fleshing things out, and are looking for suggestions and feedback so that it can evolve into an even more robust skirmish game. To say the future looks bright for ZynVaded is an understatement. I also have a suggestion for them. I'm not at all a fan of having to use a pencil/pen and paper. The current profile sheets are simply nothing more than a nicely folded sheet of single-sided photocopied paper. It would be more advantageous to have the profile sheets in card form, and of a size and dimension that would fit into CCG card protectors. This way you could use dry-erase markers, instead of pencil and paper. I never have printer ink, and my printer is crap, so once I use these sheets up, I'm done. If I had cards I could slip into card protectors I'd never need to copy a thing ever again for this game. Even if the current paper profile sheet sections were closer to the size of a standard CCG card, that would also be a major improvement. The game itself is quite genius, because being able to play it almost anywhere is a major plus. It doesn't look or feel out of place anywhere in the house, or even in the back yard, because the models are 1-to-1 scale, and they're supposed to be that size next to everything else. This opens the door to so many gameplay possibilities. With ZynVaded you could easily create a campaign event that takes place all throughout the house, with each mission taking place in a specific room. How cool is that? A messy child's bedroom is a ZynVaded battlefield with more terrain and obstacles than most will ever find on a tabletop. Even a cluttered garage floor would make a nice battlefield for this game. The possibilities are truly endless with ZynVaded. This really is an ideal skirmish game to introduce the kids to the hobby, and to the genre of wargaming too. The models are lighthearted, the rules are simple, and a father and son/daughter could setup a quick game at the breakfast table even. Since the models are different colors, you really don't even have to paint them either. That fact alone makes this one of the very few skirmish games you can play right out of the box as soon as you get it home too. I bet Gen Con attendees were playing this in their hotel rooms, simply because they could. At $30 USD the ZynVaded Starter is also quite reasonable. Even with the first run Starter models being a little rough around the edges, you're paying just $5 per model, they're resin models, and they're fantastic sculpts. That's not counting the rules, the two D10, the 3x grub markers and the key-chain measuring tape and pencils. 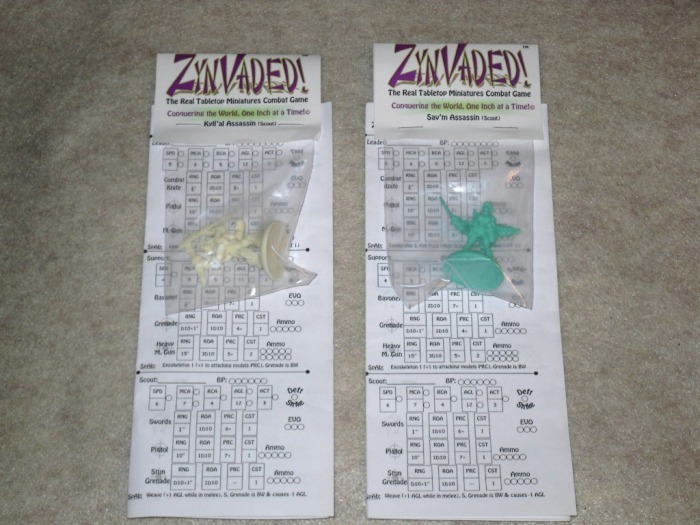 The buy in cost to ZynVaded is quite low, so there's not a lot to loose by giving it a try. 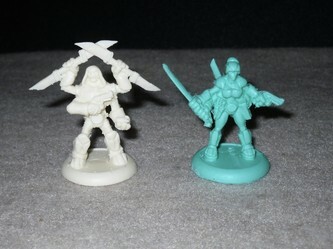 The additional Assassin models are also only $5 USD each direct from We Have Issues Publishing. 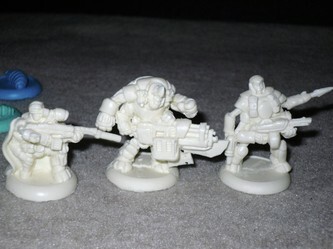 I also think that the ZynVaded models would fit in perfectly as proxy models for the new skirmish game AE Bounty. It makes use of various alien species as bounty hunters, and these definitely are some of the coolest looking alien models I've seen in a while. I've also seen others online comparing ZynVaded to Fairy Meat, and while there are some similarities since both games use 1-to-1 scale models, and both can be played anywhere; I seem to think ZynVaded is cooler, because it's more sci-fi than fantasy. These bugs aren't eating each other either. I also did some more research on Fairy Meat, and I can't find a retailer that even sells the models to play Fairy Meat with, and the parent company only seems to sell the rules for it in .pdf format. It appears the models are all out of production actually, and even the parent company Kenzer & Company doesn't offer a boxed set/starter deal with models. Therefore at present it appears ZynVaded is the more readily available game of the two 1-to-1 scale skirmish games out there. On a side note, We Have Issues Publishing is already hard at work on making re-sculpts of the existing Starter models. Some people online have pointed out that there are similarities between some parts of the models, and some of Games Workshop's models. So they've went back to the drawing board to clear up any of those possible issues, just to be safe. They also said if any existing Starter Set customers would like the new models they'd offer to swap them out for the first-run Starter models without a problem. I should also have the new version models any day now as well, and once in-hand I'll do a follow up article. 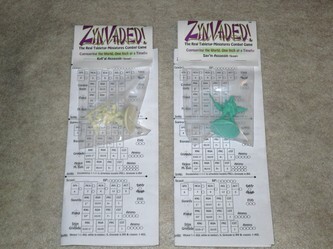 Two more races are also planned for ZynVaded, one of which should be available pretty soon, as they showed off two of the models for the new faction at GenCon already a few weeks ago.